Russian Prime Minister Vladimir Putin called the International Space Station Tuesday and told commander Scott Kelly the Russian people offered their "whole-hearted condolences" over the Tucson shooting that severely injured Rep. Gabrielle Giffords, the wife of Kelly's twin brother Mark. Giffords suffered a gunshot wound to the head in the shooting spree Saturday, which left six people dead and 13 others injured. Putin called the space station crew to discuss upcoming events being planned to mark the 50th anniversary of cosmonaut Yuri Gagarin's launch in 1961 to become the first human in space. But he began with a personal message to Kelly. 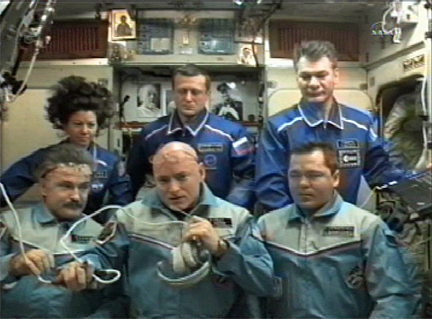 "I would like to greet everybody at the mission control (center), everybody on orbit," Putin radioed the six-member station crew. "I'd like to start our conversation today with words of the whole-hearted condolences, which I would like to express to the commander ... Mr. Scott Kelly, in relation to the assassination attempt to the congresswoman Gabrielle Giffords." In interpreted remarks, Putin told Kelly "I would like to assure you that there are no people in Russia who are not touched by this terrible news. We know that Mrs. Giffords is the wife of your brother, a NASA astronaut who has visited Moscow on Several occasions. We express our deepest condolences to your family and to all those who were touched by this terrible crime." Kelly told Putin he would pass the prime minister's comments on to his brother in Tucson.